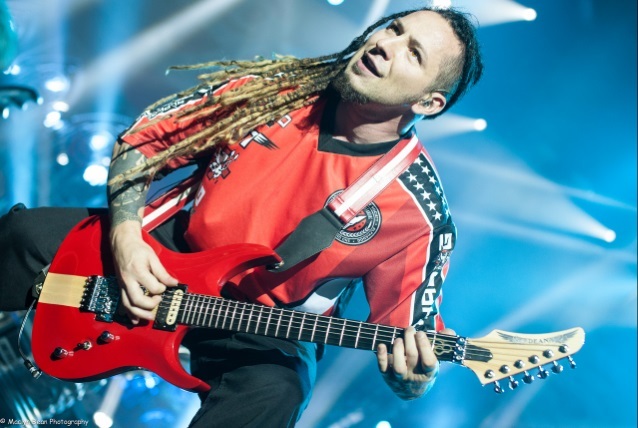 FIVE FINGER DEATH PUNCH guitarist Zoltan Bathory has no plans to write an autobiography, saying that his book "would have to serve a purpose greater" than just telling his story. Back in 2014, Bathory's FIVE FINGER bandmate, drummer Jeremy Spencer, released a memoir, "Death Punch'd: Surviving Five Finger Death Punch's Metal Mayhem", in which he wrote extensively about his lifelong struggle with drugs and alcohol. More recently, FIVE FINGER bassist Chris Kael revealed that he was working on a book called "Pounding For Pain", documenting his time with the band as well as covering his own substance abuse issues. Asked by the Live Metal web site when fans can expect to see his autobiography, Zoltan said: "I'm extremely pragmatic. Ivan [Moody, FIVE FINGER DEATH PUNCH singer] always calls me Spock because the bus can be on fire and I would calmly calculate the best way of escape and the chances of survival of all the possible scenarios. I'm a chess player; everything has to be logical, I have to create order out of chaos — while he does the opposite. [Laughs] So writing a book when people barely read seems pretty inefficient unless there was a serious demand for it, or if I have something so important to say that I just have to say it. Not sure if my autobiography would fulfill that particular parameter. So if I ever do it, it would have to serve a purpose greater than just telling my story. It would have to be educational, inspirational. It would have to focus on practical, pragmatic methods on how to make the shittiest hand life dealt you into a win, or something in that direction. I never say never, but at the moment, I have plenty of other verticals I'm quite busy with." Growing up in communist Hungary, Bathory formed FIVE FINGER DEATH PUNCH in 2005, but the band really found its voice after recruiting former MOTOGRATOR singer Ivan Moody. "I arrived in the United States with one guitar, a bag of clothes, and no idea how to speak English," Zoltan told Guitar Player magazine in a 2012 interview. "After starting about 35 bands, I finally threw everything I love about heavy metal into FIVE FINGER DEATH PUNCH. I wanted plenty of '80s-influenced solos, Bay-Area-style and technical German thrash elements, and old-school songwriting with dynamics and real choruses." Asked what it was like learning to play guitar in Hungary, Zoltan said: "It took extreme determination just to get a guitar, because communism was still raging in Hungary when I was growing up. The average adult might have made $100 per month. Imagine how it felt to discover big rock bands such as IRON MAIDEN — I was so impressed. I decided to be a guitar player, but decent instruments were not available. At age 13, I acquired a beat-up, secondhand guitar. I removed the basically unplayable bolt-on neck and replaced it with one I made from a coffee table. I painted it military green because we lived on an army base. Eventually, I acquired a playable guitar, and once communism started collapsing, I came to America." FIVE FINGER DEATH PUNCH will release its seventh full-length studio album, "And Justice For None", on May 18.